We arrived in Kuwait on Sunday afternoon after the country was recovering from a severe dust storm Friday that shut down the airport and left a layer of dust over all we could see, but for the most part everything has been cleaned up fairly quickly. Upon arrival we checked into our hotel in Kuwait City and toured the local surroundings including the Kuwait Towers and areas around the waterfront. On Monday morning we set off for our first meetings at the Annual Conference of Kuwait Society of Nuclear Medicine where international physicians and Kuwaiti officials were gathered to discuss nuclear medicine. 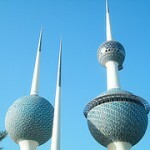 We discussed health policy in Kuwait and how the medical industry is run. We also traveled to Kuwait University – the main university in the country with more than 19,000 students and 1,000 faculty. We met with faculty from the law school and political science department where we gained a greater understanding of Kuwait’s role in the Gulf region – from mediating the recent crisis in Bahrain to the relationships with their Gulf neighbors. Kuwait is in the interesting position of having a democratic process to address grievances which has protected them from trouble plaguing other Gulf countries at the moment. The faculty discussed the role of social media and mobile technology leading the ways for citizens to be engaged with each other and the world around them and how to use those tools to connect and mobilize. For our final meeting of the day we visited the Kuwait Bar Association and focused our discussion on the legal system in Kuwait and their role in assisting Parliament in interpreting law and legal issues in the country. The conversation turned to explore the role of youth and young people in the country and the importance of involving them in the community and political process at a younger age so they see public service and politics as a way to encourage an active citizenry. I look forward to continuing our discussions on citizen engagement and civil society in Kuwait. On tomorrow’s agenda we will visit the Grand Mosque as well the National Assembly and meet with members of Parliament. The hospitality has been amazing and the desire to share culturally has made this an exciting experience so far.